I would like to thank you and your team for an amazing culinary experience last evening. You have a wonderful way of instructing. 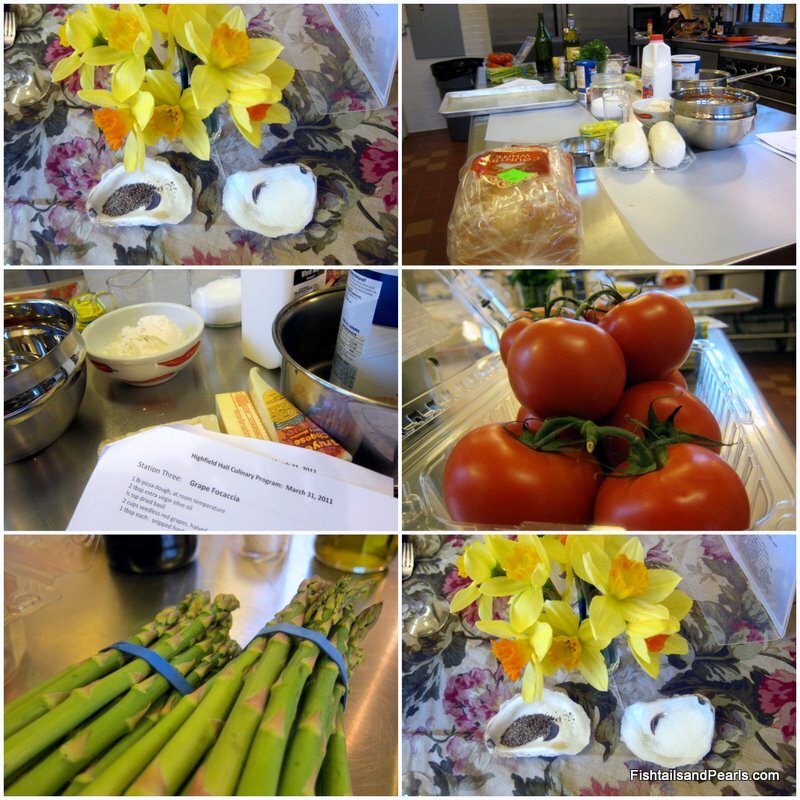 It was all such great fun and the results were delicious. Everything about the evening: Five Stars (Michelin)!!!!! Gail runs the always interesting, and engaging, culinary classes at the mansion up on the hill. You can read here about our first class in the three part series, and learn more about this cultural treasure that serves our Cape Cod community. 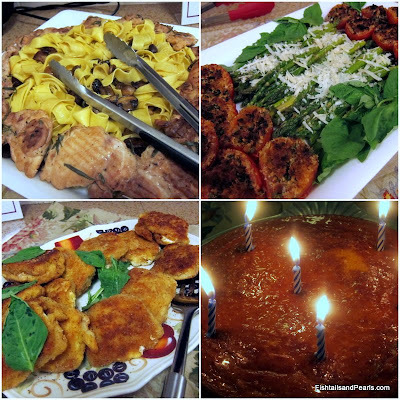 For week II we cooked up some Italian favorites. Salute, to all those who shared in the preparation, and thanks to Robert for the very kind words. 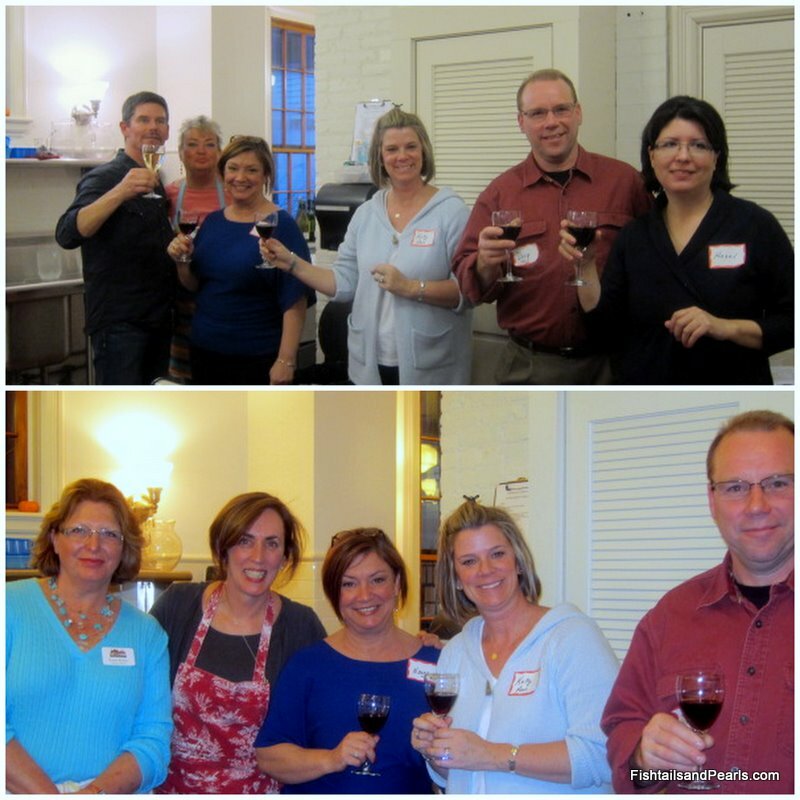 When nice people come together around a shared goal, a little magic happens. Perhaps all dinner parties should be organized this way. It would certainly lighten the workload for the host or hostess, and it's a great ice breaker. Just remember that all great productions need a talented director, so you may want to consult Gail for a few prep tips. Her organizational skills are superb! After the introductions and menu overview, I demonstrated the preparation of the Orange Scented Olive Oil Cake. 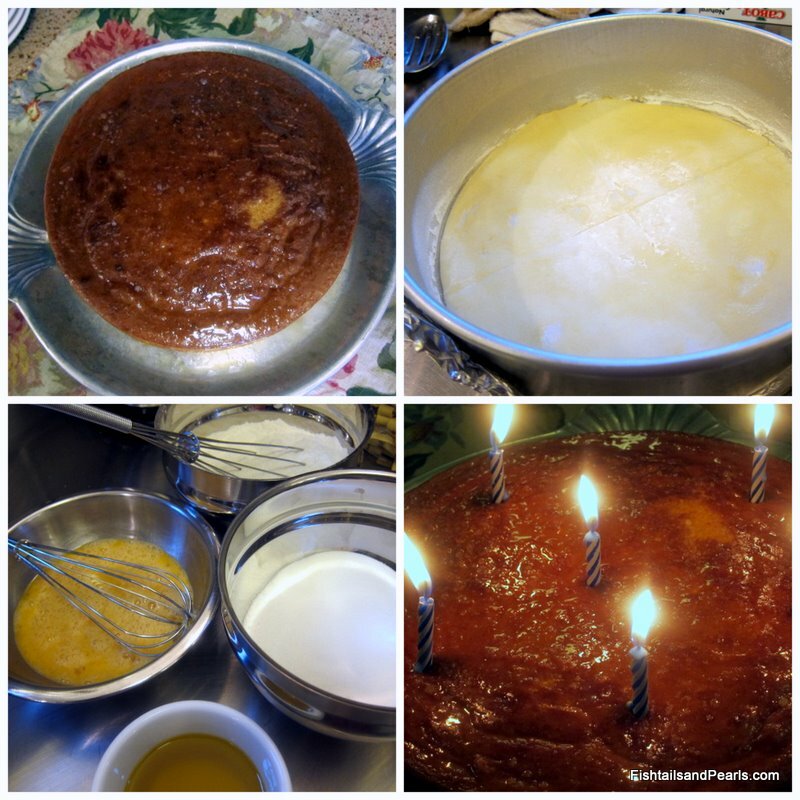 Karen, our lovely volunteer, prepared one earlier in the day so we enjoyed that one after dinner. Its light and flavorful, and you could easily substitute lemons. We all agreed that fresh fruit would be a nice accompaniment, especially blueberries if you were to make a lemon version. Our 'Twos' eagerly manned the stations to prepare their individual contribution to the meal. 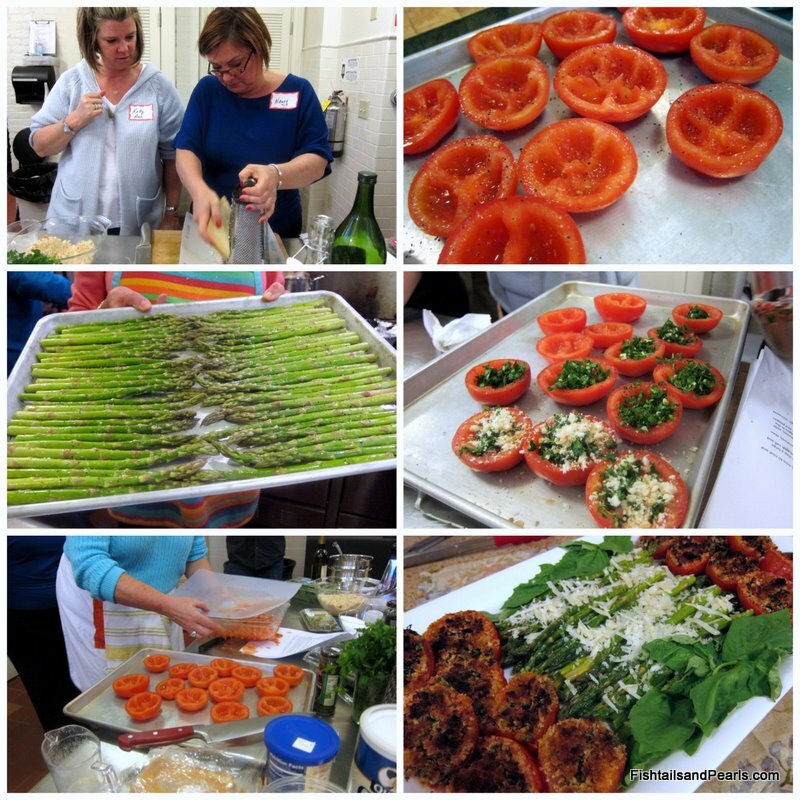 Nancy and Kelly Ann did a wonderful job on the roasted asparagus and baked stuffed tomato platter. It was fun watching them attend to every detail of the recipe as they turned out this lovely presentation. 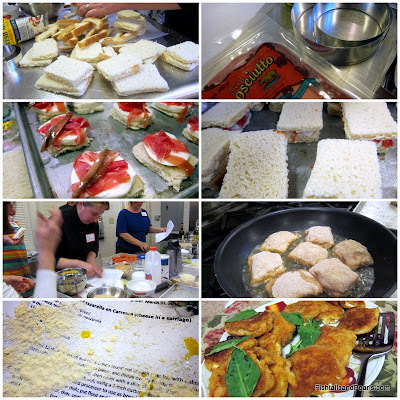 Linda and Jen tackled the Mozzarella en Carrozza, sandwiches filled with fresh mozzarella, prosciutto and anchovies, that are then breaded and fried in olive oil. This mother and daughter team took it in stride when they had to recalculate their bread cutting strategy to increase the yield. They applied a few mathematic calculations and voila, problem solved. Notice their recipe covered with ingredients; a telltale sign of serious and engaged cooks. The end result was impressive. 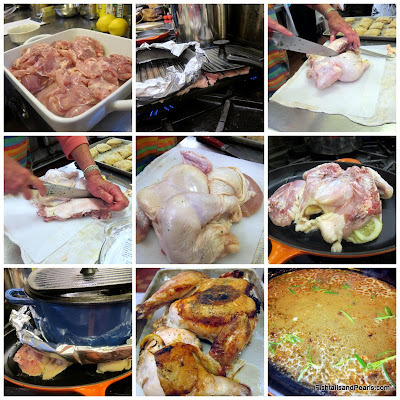 Doug and Hazel worked together on the chicken with rosemary cooked under a brick. Actually we used a cast iron pan and a panini press for weights, which worked just fine. Gail also showed us how to prepare a spatchcock, or butterflied chicken. This involves removing the back and breast bones so you can lay it on the grill, or in a cast iron pan to cook. She slipped lemons and rosemary under the skin, sprinkled it with salt and pepper and placed it skin side down in the hot pan. We applied a few heavy pans as weights and let it cook for about 30 minutes over medium heat. You can flip it, or do as Gail did and finish it in a 400 degree oven for another 25-30 minutes. After the chicken went into the oven, I de-glazed the pan with lemon juice, butter, white wine and fresh rosemary which we poured over the chicken pieces. Both preparations were tender, juicy, and delicious. 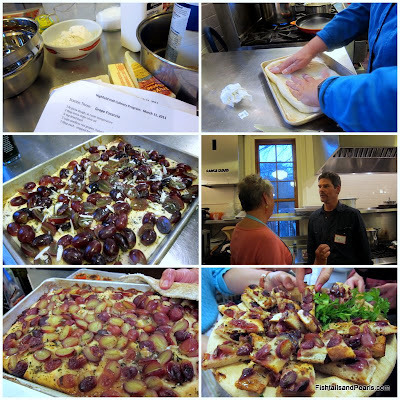 Robert and Betty got their hands into the pizza dough to create the Grape Focaccia. They were a little curious about the flavor combination, as were a few others, but we were all pleasantly surprised at tasting time. The hint of rosemary, with a light sprinkle of grated cheese, was a nice contrast to the sweetness of the grapes. 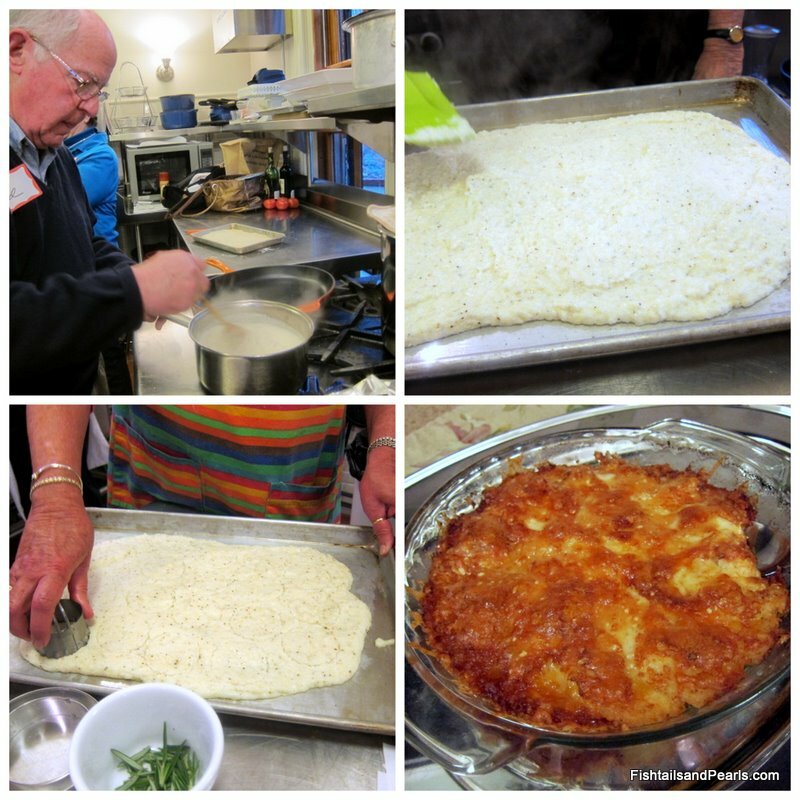 Ted and Priscilla prepared the Gnocchi alla Romano. This recipe comes from Gail's very first cookbook and more resembles a quick and easy version of polenta. It's pretty simple to make, and always a crowd-pleaser. This is their second class with us, and as new residents of Falmouth they thought it would be a nice way to meet people. I noticed they were exchanging contract information with Karen, so it appears to have worked out well. The dish worked out well. too. This crowd was definitely pleased. I finished up with a demonstration of the Papparadelle with Roasted Mushrooms and Truffle Oil. Gail roasted the mushrooms (shittake, cremini and white) earlier, and left them to sit at room temperature so their flavor intensified . As the pasta cooked, I prepared the truffle sauce, then added the mushrooms, pasta and a little bit of the pasta water. It was the perfect side dish for both chicken preparations. As we all sat down to enjoy the fruits of our collective labor, I was again touched by the warm and friendly conversation, the laughter, and the sheer joy that comes from sharing a well cooked meal. 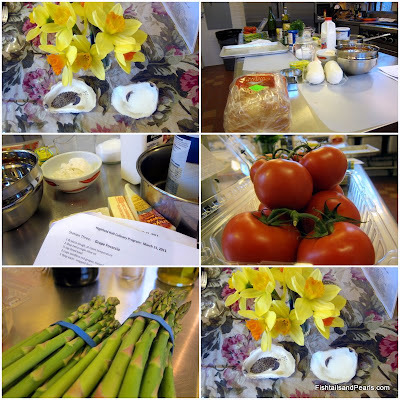 It's what motivates me to cook, to want to teach others, and to continue learning. Take a look, maybe there's something you'd like to learn about in one of the classes up on the hill. Buon Appetito!